Every mathematician worthy of the name has experienced, if only rarely, the state of lucid exaltation in which one thought succeeds another as if miraculously… this feeling may last for hours at a time, even for days. Once you have experienced it, you are eager to repeat it but unable to do it at will, unless perhaps by dogged work…. In The Apprenticeship of a Mathematician (1992), 91. 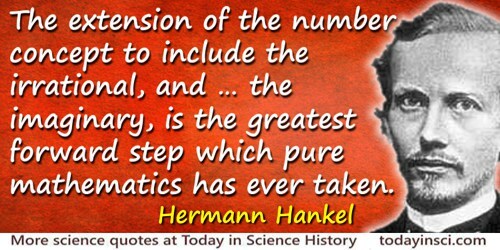 Mathematics is the gate and key of the sciences. ... Neglect of mathematics works injury to all knowledge, since he who is ignorant of it cannot know the other sciences or the things of this world. And what is worse, men who are thus ignorant are unable to perceive their own ignorance and so do not seek a remedy. In Opus Majus, Part 4, Distinctia Prima, cap. 1. Report, Integrity in the College Curriculum (Feb 1985). [The National Academy of Sciences] would be unable to give a unanimous decision if asked whether the sun would rise tomorrow. In David M. Rorvik, 'Ecology’s Angry Lobbyist: Dr. Paul Ehrlich Argues That the Chief Cause of Pollution Is Overpopulation', Look (21 Apr 1970). As quoted and cited in Columbia World of Quotations (1966).